Thousands of spring breakers gather behind Isla Grand Hotel on South Padre Island Tuesday as they prepare to hear the American hip hop trio Migos during Rock Star Beach Bash Music Festival. SOUTH PADRE ISLAND — Bryan Walker was strolling down Gulf Boulevard with two female friends from Indiana University. They were walking off their Whataburger meals and planning for a Migos concert they were planning to head to later on Rock Star Beach. 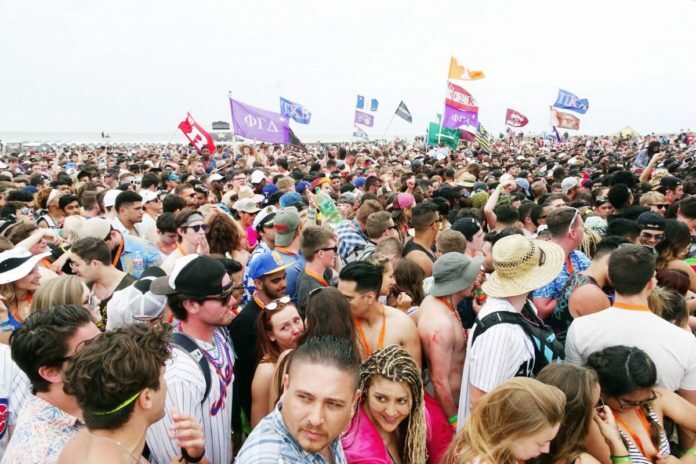 “I came to South Padre Island because this is the best place on the planet to party,” Walker said, standing a few feet from the Starlight beach access. One year ago, Walker was in his finance class when his friend told him South Padre Island was the best place to party for Spring Break. “Now we’re here,” he said excitingly. Thousands of spring breakers from Texas and throughout the country have left their books behind and descended on the Island to party, have a good time and enjoy the music. During the course of Spring Break, many hip hop artists and DJs from around the world will be spinning record remixes. But some residents are still not happy about South Padre Island being a vacation destination for college kids. Barry Sullivan, 72, has lived in the Tiki Condominiums since 2013. It’s located next to Clayton’s Beach Bar. Sullivan called the Tiki Condominiums a family oriented resort that relies on families to come and stay. Sullivan was referring to Tekashi69, who is scheduled to perform at Clayton’s. Tekashi earned two singles on the Billboard Hot 100 and once was widely considered one of 2017’s breakout stars in music. According to news reports, Tekashi69, whose real name is Daniel Hernandez, has had shows that have ended in violence. But that has not stopped Clayton’s from hosting the music talent and throwing the biggest beach parties during Spring Break. MC Pete $$$ hyped the Clayton’s crowed Tuesday, counting down to the rap show featuring Future, an American rapper from Atlanta. In the pit, the students were dancing, chugging beer and smoking, and had long forgotten about finals week. Brashear held lemonade in one hand as he watched the stage and students on the beach from the bar on the deck overlooking the beach. He said his establishment is getting some negative feedback on Facebook from people who don’t want business on the Island. Blain McCulloch, 69, used to be program director for a rock radio station located on South Padre Island. For about 20 years, McCulloch did radio remote broadcasts during Spring Break, and later represented Banana Boat and Hawaiian Tropic Suncare. Those comments don’t seem to be affecting anyone, much less Brashear. Beachgoers walked on to the sand nonstop Tuesday at Clayton’s, and they were lined up while waiting to get into RockStarBeach. He said part of that increase is first-time visitors who normally go to the recently storm-damaged Port Aransas area. And all the predictions were right. Max and Amber Mills flew in from Austin and San Antonio to meet their parents on South Padre for a vacation from work. Normally, they said, they go to Galveston Beach or Port Aransas for Spring Break. “We came down here because the hurricane nuked those beaches,” Max Mills said. On Tuesday, they woke up late, and spent the afternoon boogie boarding and enjoying the beachside bar drinks at Wana-Wana. “We are seeing a lot of families, and people are having a really good time. When you get 50,000 people, you’re going to have some incidents. I am very happy with how everything is going,” said Susan Guthrie, Island city manager. Instead of Spring Break, McCulloch would like to see a Spring Festival with activities related to the beach and water such as volleyball tournaments, surfing, sand castle contests and other beach-related events. This would showcase South Padre Island. Carey Kinsolving contributed to this report.